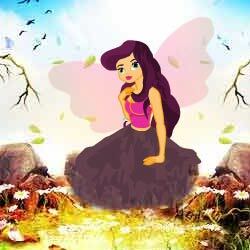 Forest fairy escape is the new point and click escape game, free escape game from ajazgames. Strolling along the forest, collecting beautiful flowers and petals, you see fairy sitting and struggling to escape the from the place, but it looks like a magic wand is required to get the fairy escape. Solve the puzzles and the flowers and petals you have collected seems to be some of the clues to help the beautiful fairy escape. All the best, wish you Good luck, have fun playing new online free escape games from ajazgames.